Fortunately for collectors of Smith & Wesson firearms, answers to some of those questions are available, at least in the form of a birth certificate. The Smith & Wesson company has a living treasure in a man named Roy Jinks. Mr. Jinks is the Smith & Wesson historian. When the old Smith & Wesson factory was demolished in 1971, the city of Springfield first sold it to Mr. Jinks for $1 and gave him a week to salvage whatever he desired. 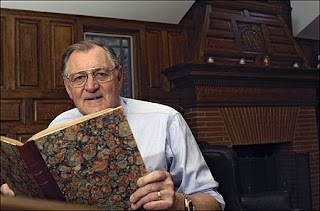 Along with many historical finds, Mr. Jinks also acquired the original chestnut paneling from D. B. Wesson's office, which he had installed in his own home. Also saved was a library of volumes that contain every firearms patent issued in the United States from June 29, 1832, to May 17, 1921. These were compiled and bound first by D. B. Wesson, who died in 1906, and then his sons. Roy Jinks uses this, as well as Smith & Wesson's own company records to research firearms by serial number for collectors. A letter from Mr.Jinks will undeniably verify the configuration of a gun when it left the S&W factory. The letter will state the serial number of the gun, it's caliber, barrel length, finish, sight configuration, and possibly other items if they were special ordered. There have been several fraudulent guns tossed aside as the result of a Jinks letter. Historical attributions have been proven both valid, possible, and impossible after a Jinks letter was received. If you own an old Smith, especially an unusual variation, then a letter from Roy Jinks could be the most important improvement you could make to the preservation and value of your firearm. Prior to requesting a letter on your handgun, first make certain you have an authentic Smith & Wesson handgun. If the barrel is not stamped Smith & Wesson, Springfield, Massachusetts or Smith & Wesson, Houlton, ME your handgun is not a Smith & Wesson. Many handguns are stamped with the caliber, i.e., .38 S&W. This indicates the caliber and does not necessarily mean that it is a Smith & Wesson manufactured handgun. Remember also, like guns, documentation can be faked. Mr. Jinks will gladly write a new factory letter on a gun that has already been lettered in order to confirm the information in the earlier letter. 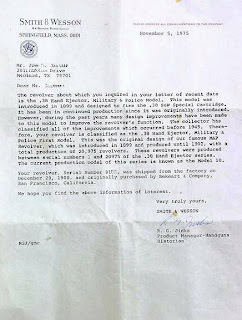 To receive a Roy Jinks factory letter for your Smith & Wesson, go to S&W History Request open up the pdf file to obtain a request form, and fill it out. Provide a complete description of the firearm that includes all markings, barrel length, finish, single or double action, exposed or concealed hammer and a photograph or outline sketch. If you do not know the exact caliber of the revolver please measure the length of the cylinder and include that with the description. This will aid in the identification of the handgun. If your revolver is marked with the Model Number it is not necessary to include an outline sketch or photograph. This information helps Mr. Jinks verify variations as correct or at least plausible, and it also lets him know what you want. There is a fee of $30 to cover research, administrative and postage costs. When I was in 8th grade I bought was was advertised as a nickle K-22, silver box, blue printing, nice gun, pinned barrel, I sent my request to Mr. Jinks and he advised that the pistol left S&W in 1952 as a blue to a company in NYC, they prob plated it, nice job, sorry I tossed the box as a kid, sweet trigger ect. I found my Jinks letter, My k-22 (K-1509XX) was shipped blue with orig magna grips, in a lot of 25 to J.L. Galef & Sons, New York City. "nickel plating was not original" it is still a great pistol and for the $98.00 I pain in eight grade....any one know about Galef & Sons?